almotamar.net - Appeals section at the Criminal Court in Yemen upheld Monday the death sentence against the first defendant in the Sana’a Cell two terrorist group and jailed 14 others for different terms after being convicted forming an armed group and killing two security officers. confirmed the primary verdict on execution of the defendant Jaafar al-Marhabi and upheld the imprisonment of 4 of them for 10 years. They are Abdulkarim Humaidan, Mahfud Abdullah al-Kuhlani, Ali Muhsin al-Hamzi and Yahya Mohammed al-Kuhlani. 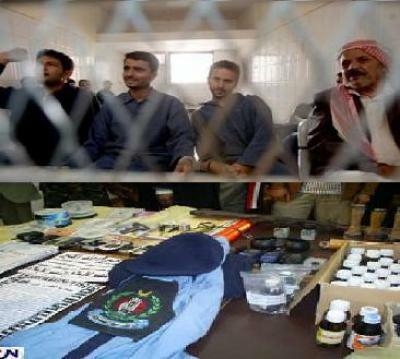 The court judgment sentenced for 8 years imprisonment both members of the cell Khalil Mahdi al-Hasami and Ismael Mutahar al-Shami. Members of the terrorist group Muna Zaid al-Khalid and Ahmed Mohammed al-Marhami were given 3 years imprisonment. Abdulqadir Sharafudin sentenced to one year in jail and acquitted Saada Saleh Faqieh. The group was convicted of joining an armed criminal gang, plotting attacks against military camps and units as well as military vehicles, and planning to contaminate the water supply of military bases. They were also found guilty of resisting security authorities and killing two police officers. They were also found guilty of writing messages and spending money for supporting and buying requirements and means for implementation in addition to publications and recordings for publishing false reports and statements aimed at arousing panic and weaken the people morale. Two of the cell members were accused of possessing explosives and buying and selling dealings without having official licenses. One of the female defendants were accused of hiding the defendant sentenced to death despite of her knowledge he was wanted by security in addition to hiding large sums of money gained from a committed crime.